His skin tanned by the sun, a proud, mischievous smile playing around his lips, the man stands in front of a thatched wooden house in the low-lying sun. He wears high boots, and a sturdy woollen jacket and trousers. With his right hand he clasps the lower end of a simple chair’s back leg, and holds it horizontal in the air, seemingly effortlessly. 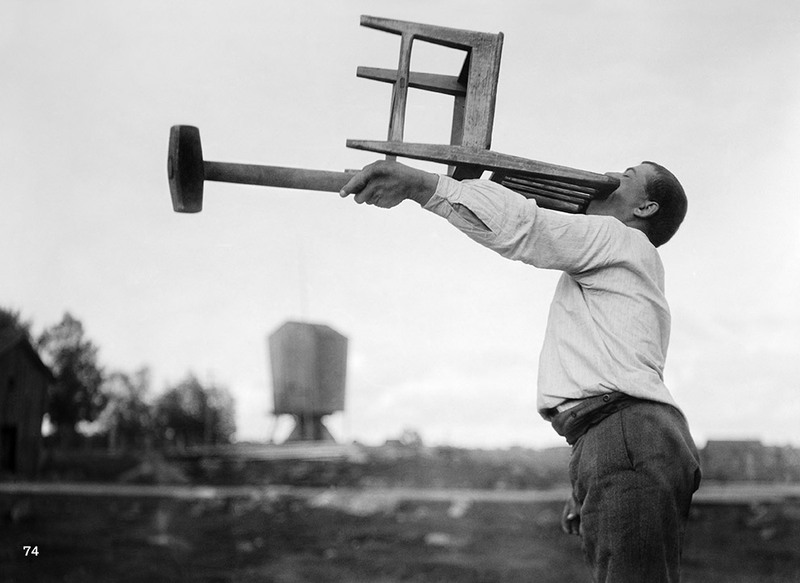 “Hålla stol på rak arm” – holding a chair with your outstretched arm is the name of the exercise, and you can see he is having fun, and enjoys demonstrating his strength. 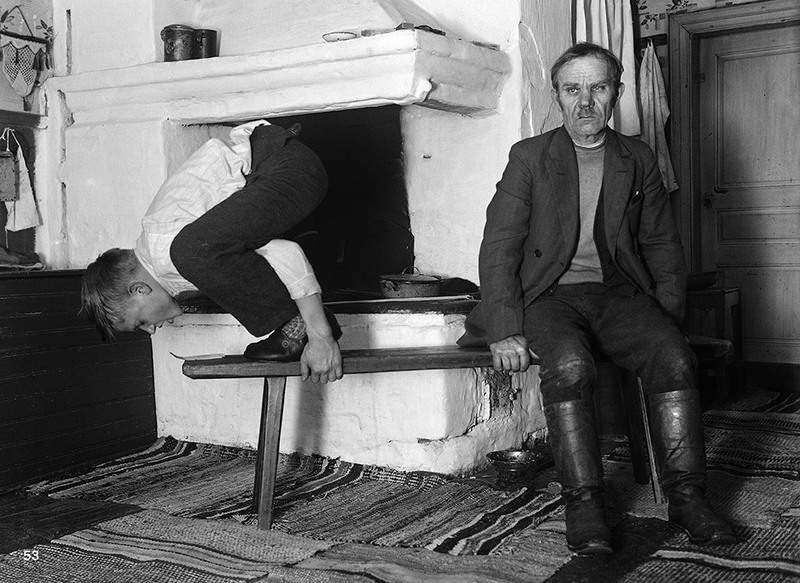 In another exercise called “Taga upp halmstrået” a man with his hands behind his back has to lift a small bundle of hay from the floor using his mouth. Or there’s “Lyfta med munnen halv tunna korn”, where the task is to lift half a sack of grain, again using your mouth. Another man smiling broadly lifts up an anvil, while someone else heaves himself upward on a pole he holds tightly with both hands, and yet another attempts to walk upright along the curved blade of a scythe. 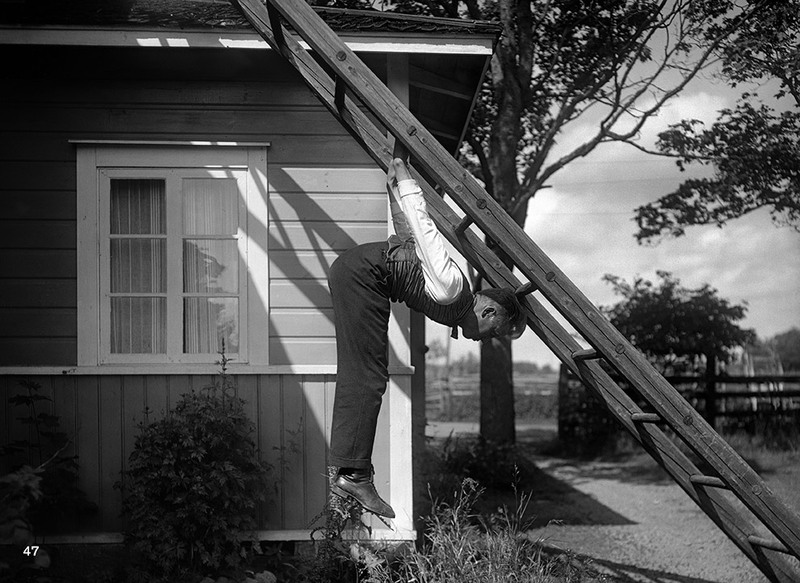 The term “field study”, and that is what Helsinki ethnologist and gymnastics teacher Maximilian Stejskal (1906 to 1991) carried out for his PhD thesis, can be taken literally in a society shaped by farming. 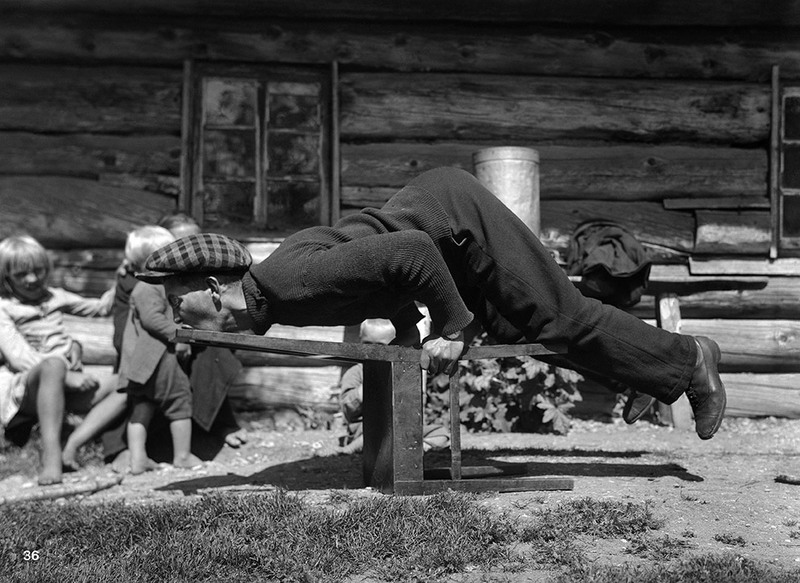 For their exercises, gymnastics, games and competitions the men used everything they otherwise had to hand for work – from scythes to bales of straw, from tables to tree stumps, from kitchen benches to flagpoles. 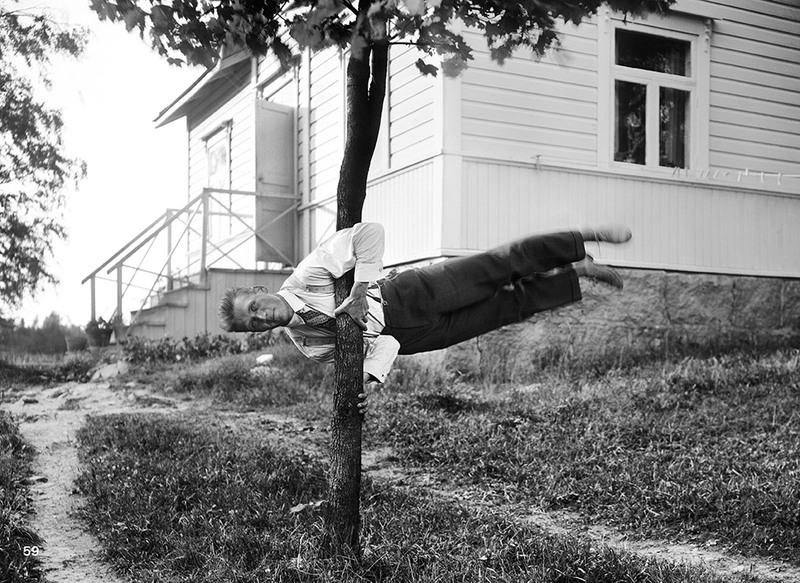 Between 1929 and 1937, and again in 1948, Stejskal spent one to two months cycling from village to village in southern and eastern Finland, and had somewhat older farm hands, farmers and labourers show him how they had proven their strength and agility when they were still youths or young men. Such tests of strength had more the character of a competition than exercise. 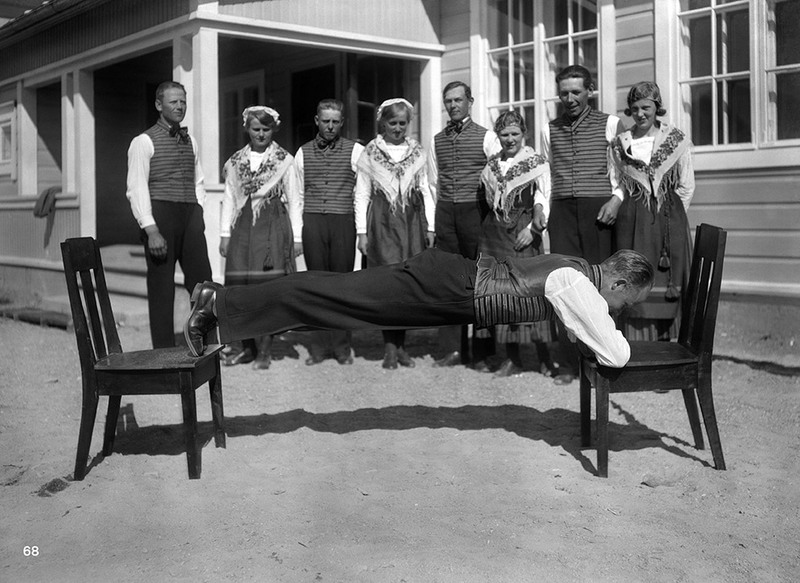 However, the traditional games, known as the “Folklig Idrott”, in which the young rural population competed around 1900, had as good as died out by the time Stejskal cycled through the country with two bellow cameras, glass plates, and a tape recorder with which he recorded music. He took a total of 433 photographs, wrote travel reports, had people describe the exercises, and noted down the rules of the competitions. At first sight the series of black-and-white images selected for the book appear as absurd as stills from a silent movie. Tests of masculinity, dexterity and of courage are interspersed with gymnastics; folk festivals, initiation rites, amusement and sports coincide. Finger wrestling is just as much fun as heaving stones. After all, those that managed to lift the heavy boulders up to knee height were deemed good material as husbands. Alongside their ethnographic and scientific value, the images also have another more artistic and aesthetic aspect. The topic of re-enactments – and yes Stejskal’s photos are re-enacted – is currently on everyone’s lips, and it is probably no coincidence that the editors of this publication, Marie-Isabel Vogel and Alain Rappaport, are themselves artists and set designers based in Zurich, Switzerland. Presumably for them, too, the photographs’ appeal is not restricted to the aspect of ethnology. Anyone who regards the folk competitions from this perspective will find echoes of the Reform movement, craft, Spiritism (including moving tables) or August Sanders’ typological portrait photographs but also today’s notions of body tracking and shaping. Here and there it is even possible to discern a link to Erwin Wurm’s “one minute sculptures” or the “Living Sculptures” by Gilbert and George. Certainly comparing later re-enactments of these re-enactments (no matter in what respect) holds a certain appeal. 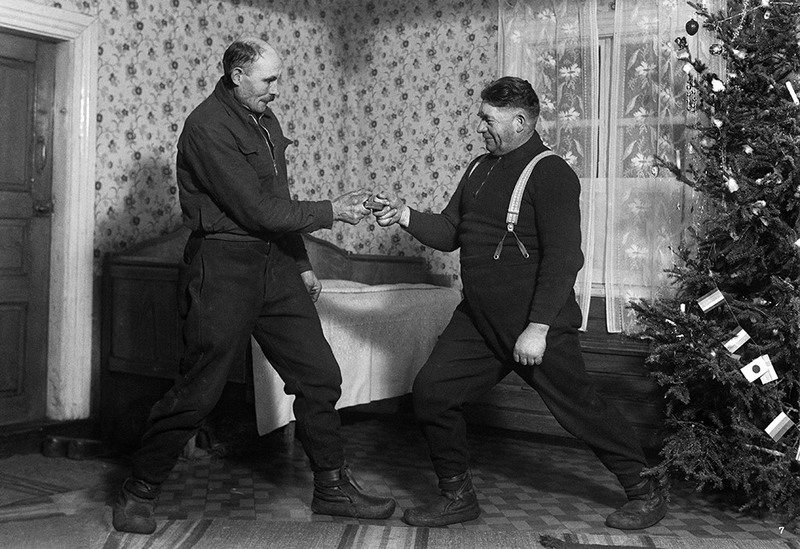 While the British duo Gilbert and George relies less on gymnastic exercises and more on song or onomatopoeic elements (“we get drunk ... we get very drunk ... we get very, very drunk ...”), sadly nothing is known about the musical skills of young Finnish farmers. But the one or other “Folklig Idrott” can nonetheless be put to practical use today: When in the coming weeks the European Championship in football enters its decisive phase, and you get increasingly cramped from all that sitting on the sofa watching the games, we recommend the exercise “Stiga upp med flaska på pannan”. It’s really simple and can also be tried out with friends: anyone who manages to stand up from a kneeling position while balancing a bottle on their forehead, has won. Unfortunately, the Finns are not in the European Championship. But the exercise can still be performed in their honour. 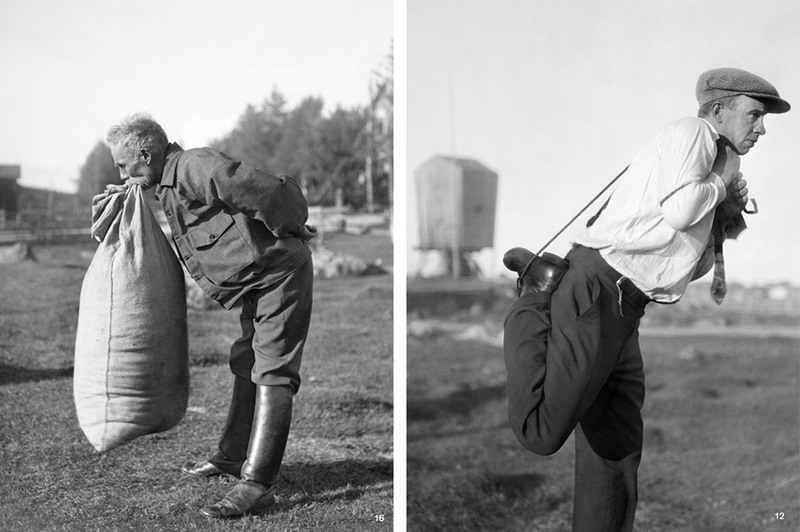 Lyfta med munnen halv tunna korn – Lifting a grain sack by mouth und Latmansbördan (left) and Lazy man’s burden – Lazy man’s burden.